On the last weekend of October the brothers of Wahunsenakah Lodge 333 celebrated their Fall Fellowship at Bayport Scout Reservation, with an event that was cut short by the impending arrival of Hurricane Sandy. The Lodge issued an oval activity patch commemorating the Battle of Yorktown as the fifth of their series honoring the Civil War Sesquicentennial. 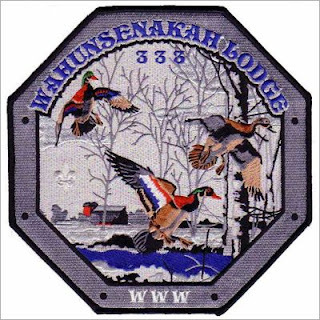 The final patch of the series will be for the last Lodge activity of 2012, the Holiday Banquet held in December. Thanks to Larry Johnson for the picture of the Fall Fellowship patch. Wahunsenakah Lodge held their Summer Service weekend September 14-16 at Bayport Scout Reservation, and issued their fourth oval activity patch in a series recognizing the Civil War Sesquicentennial. This patch honors the Battle of Big Bethel, the first land battle of the war inVirginia, which occurred on June 10, 1861. 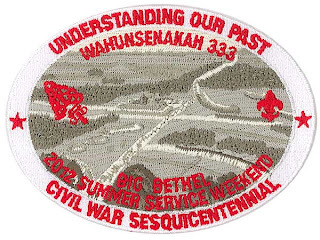 Lodge 333 held their annual Spring Service Weekend at Bayport Scout Reservation May 18-20 and issued a third oval activity patch in their series recognizing the Civil War Sesquicentennial. 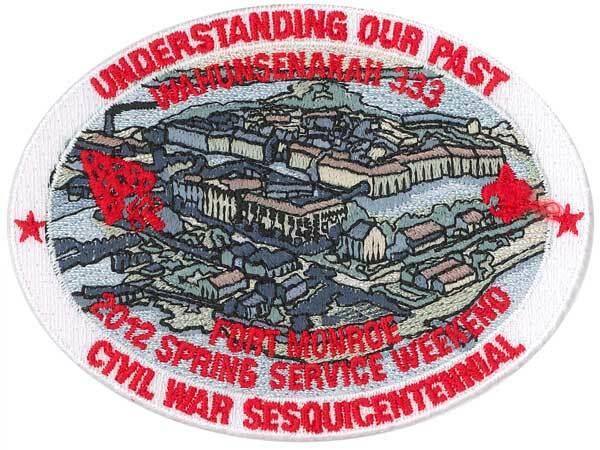 This patch honors historic Fort Monroe. One of the challenges facing collectors who seek to add multiple varieties of Scout emblems to their collection is being able to identify which variety you are looking at. Patches that have slight color variations are especially difficult to positively identify unless you have samples to compare them to. 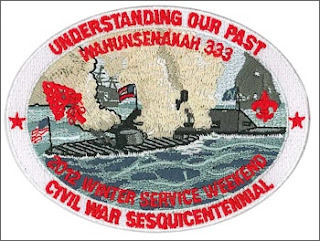 The primary differences listed are the brown vs. reddish brown color of the Native American featured on the patch and the size of the arrow fletchings. The X2a also has a darker yellow border. While the two patches I own appeared to have visible thread color differences they looked more alike the longer I examined them and I could make the colors virtually identical depending upon the angle of the light they were in. I won't even tell you how frustrating it is to try to measure arrow fletchings to the millimeter! Mike kindly loaned me his Chanco X2a and X2b patches which I carefully labeled as soon as they arrived. I compared them to my own and was glad to confirm that each of my versions matched his. 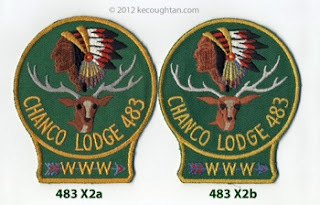 In case you ever wonder which variety you are looking at, I've scanned them side by side, front and back, and added them to the kecoughtan.com web site on the Chanco emblems page so you can use the photos to help identify your patch. 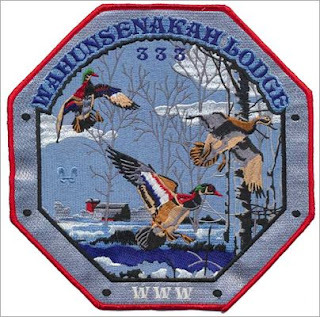 The 2012 Section SR-7A conclave will be hosted by Shenshawpotoo Lodge 276 at Camp Rock Enon in Gore, VA April 27-29. 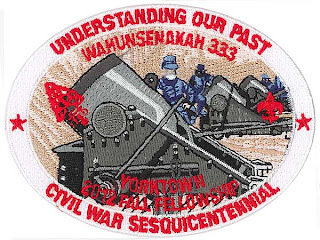 Arrowmen from Wahunsenakah Lodge will be wearing a commemorative flap recognizing the Sesquicentennial of the Civil War picturing the historic Battle of Hampton Roads, also known as the Battle of Monitor and Merrimack. 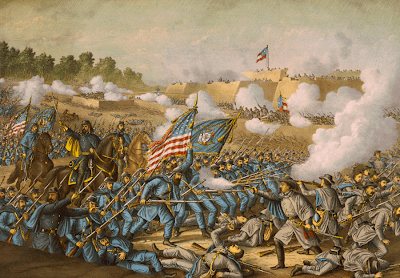 The Confederate CSS Virginia (built from remnants of the sunken Merrimack) battled the USS Monitor to a stalemate in the first naval battle between two ironclad warships. 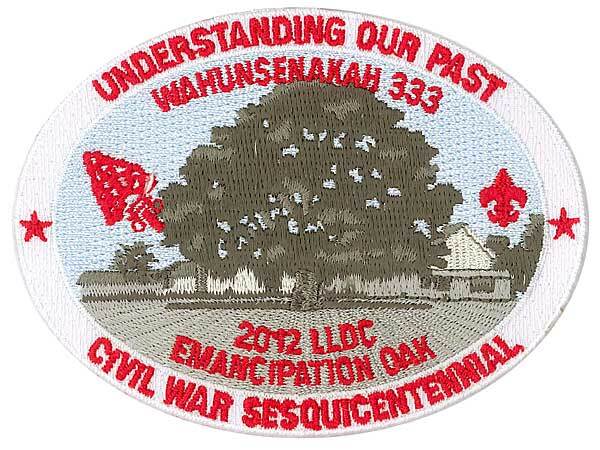 Designs for other Wahunsenakah patches scheduled for release in 2012 will also honor the Civil War Sesquicentennial and recognize historic locations in the area served by the Council. Thanks to George Homewood for the picture of the Lodge 333 2012 Conclave flap. 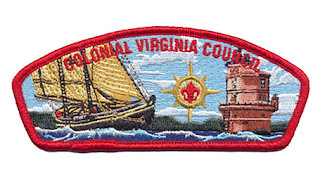 Colonial Virginia Council has issued their ninth Friends of Scouting CSP in the Scout Law series of twelve. The theme for this year's patch is "A Scout Is Thrifty." 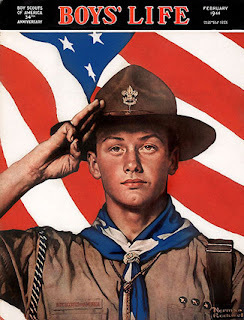 The 2012 FOS patch takes its design from the 1944 Norman Rockwell painting entitled "We Too Have A Job To Do" that features a saluting Boy Scout in front of an American flag background. The painting was used to rally Scouts to volunteer service during World War II. For example, Scouts collected 10.5 million tons of scrap aluminum in 1941—88 percent of the total collected by all Americans (from Scouting magazine). Like many Councils across the country, Colonial Virginia Council relies upon contributions through its Friends of Scouting program to help fund the programs for the more than 6,000 Scouts they serve. 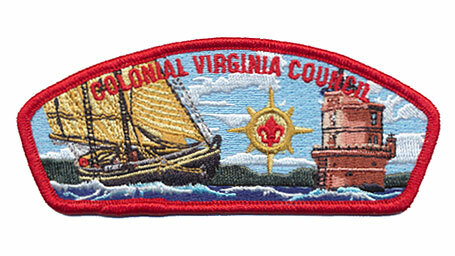 Learn more about the program and consider a contribution today by downloading the Colonial Virginia Council 2012 Friends of Scouting brochure. 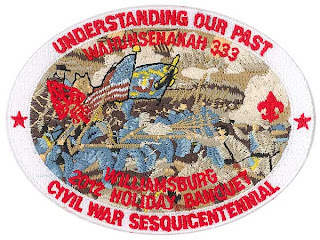 You can view this and all of the Friends of Scouting patches on the Colonial Virginia Council FOS issues page at kecoughtan.com. 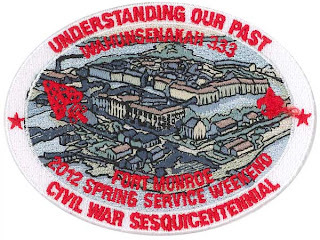 Thanks to Larry Johnson for the picture of the 2012 CVC FOS patch. Jason Spangler (aka Santeeswapper) is currently selling a leather Kecoughtan flap shaped item on eBay that is similar to but at the same time very unlike other varieties I've seen before. This example only has the center acorn, with no flags or smaller acorns, and has holes punched in the corners, presumably to enable attaching it to something since sewing leather is not an easy task. When you compare the picture of the item on eBay with other Kecoughtan leather flap examples the center acorn design appears to be the same, indicating that the same stamp was used. 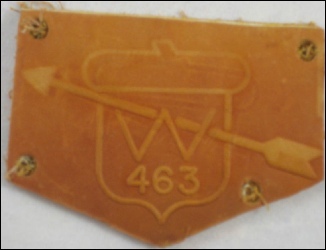 Most Kecoughtan collectors I have spoken to about the leather flaps are of the opinion that it was never an official lodge issue, but probably the result of a crafts opportunity at lodge events. If you know more about the leather flap issues from this lodge, please share them in the comments. 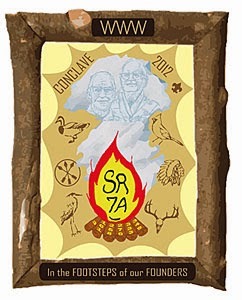 Section SR-7A will hold their 2012 conclave April 27-29 at Camp Rock Enon in Gore, VA, hosted by Shenshawpotoo Lodge 276. Registration for the conclave is now open online, and a tour of the order form for Trading Post items reveals design artwork for several emblems, including the pocket and jacket patch (pictured above). 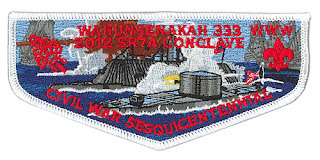 Check out the new 2012 SR-7A Conclave page at va-oa.org for additional images, including pictures of the conclave hat, polo shirt, and more, including the special SR-7A 15th Anniversary patch that will be issued.